If you would like to audition but are unable to make any of these times, please contact auditions@sierrastages.org. 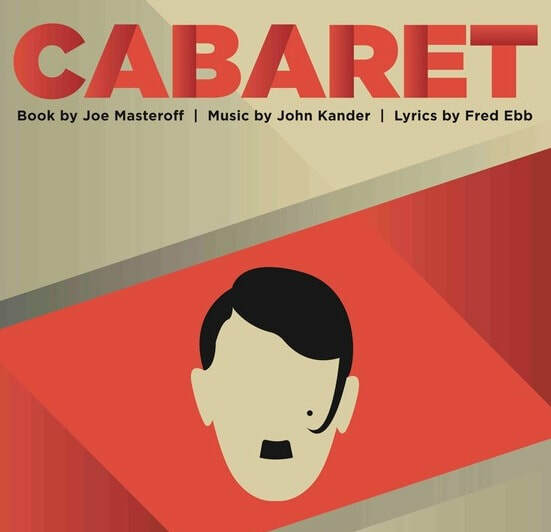 NOTE: There have been several versions of CABARET. We will be performing the latest version (released in 1998), not the 1966, 1987, or movie version. You can find information about the three stage versions of the show here. Auditions will take place at Sierra Stages' rehearsal studio at Peace Lutheran Church, in Grass Valley (828 W. Main St, Grass Valley). ​For directions, click here. Callbacks will be held on a date/time to be announced. If you are called back for one or more roles, we'll email you with scheduling and other information. Not every actor who auditions will be asked to the callbacks, and casting some parts may not require a callback audition. NOTE: All roles in CABARET are unpaid. In order to streamline the auditions, we would like you to pick a time slot. Please make sure you fill out the Audition Scheduling Survey, so that we can make best use of your valuable time. ﻿​You can also fill out the audition form ahead of time, so you don't need to do it when you arrive at the auditions. Please download, print and fill in the audition form, if you can. You can also fill out the form online, if you'd prefer. ﻿Also, please join our mailing list so we can keep you up to date about future auditions and events. A song from a musical with written-out sheet music (please, no charts/lead sheets) in the correct key. An accompanist will be provided. If you have questions about an audition song, contact the musical director (click the link to send email, or call 530-346-3210). You will be asked to learn and perform a simple set of dance steps: Wear comfortable clothing and shoes you can move in--not sneakers or other rubber-soled shoes. You may be asked to read a scene from the show; materials will be available at the audition. Perusal copies of the script are available, on request. Please contact auditions@sierrastages.org, or call 530-346-3210 for more information. Rehearsals generally occur on Sundays (2 PM to 5PM or 5PM to 8PM), and Mondays through Thursdays (6PM to 9PM). Staging rehearsals start May 5, 2019. Music rehearsals will start earlier, at the convenience of the actors. We plan to have all music learned by the first staging rehearsal. The show will run from July 11 through August 3 at the Nevada Theatre. 2. Fill out the audition survey and choose a date/time. 3. Prepare a song, and bring a printed copy of the song, in the correct key, to the audition. 4. You may find it useful to view one of the many clips from the show online on YouTube. This link takes you to a copy of the Broadway show from 1998 or so. For specific details, contact auditions@sierrastages.org, or call 530-346-3210. At this time, all roles are open. Master of Ceremonies (Emcee) (male) age 18-64: actor of indeterminate age to play relatively androgynous, the host at the Kit Kat Klub, presented as a gender-neutral character, actor must be comfortable with being close to both men and women, character is mercurial and unpredictable, and requires a performer comfortable with taking huge risks and implementing improvisational skills in performance, actor must be charismatic, hugely sympathetic and likable, yet a little bit scary, think of this character as a slow-motion car crash that you don’t want to watch, but can’t quite stop watching, role is both comedic and dramatic, and requires agile stage movement and dance, character speaks with a German accent. Sally Bowles (female), age 20-50: gritty belter, low A to high C, a British cabaret singer at the Kit Kat Klub, a quirky character who comes across as flighty, yet at times struggles with knowing the darkness of the reality of her life as a cabaret performer, role requires a performer capable of handling this very complex duality, her flightiness is a mask for her considerable depth and insecurity, speaks with a British accent; casting personnel state: "We do not want a 'dumb' Sally Bowles, nor do we want Liza Minnelli’s level of bubbling effervescence; this is a different kind of Sally altogether." Clifford Bradshaw (male), age 20-40: tenor, low A to high E, an American novelist traveling in Berlin, a man exploring his sexuality, he is first and foremost an observer and writer, but he finds himself drawn deeply into a world of desperation and decadence that he does not fully understand, speaks with an American accent. Fräulein Schneider (female), age 50+: vocal range: low D to Ab above middle C, alto; a landlady who rents rooms in her large flat; comfortable with stage movement and light dance (waltz); speaks with a German accent. Herr Schultz (male), age 50+: vocal range: low G to high F, tenor; one of Fraulein Schneider’s roomers and the proprietor of a fruit shop; comfortable with stage movement and light dance; speaks with a German accent. Fräulein Kost. age 18 to 40: alto/mezzo, low A flat to high F, one of Fraulein Schneider’s roomers, a tough survivor, does what she needs to survive and is unapologetic for it, earns money by offering "services" to sailors, actor must exhibit a strong sexual comfort and commanding nature, and be comfortable with stage movement, speaks with a German accent. Ernst Ludwig (age 18 to 45): baritone, a friendly and likable German, with a very disturbing dark side, speaks with a German accent, actor must be comfortable with stage movement and light dance (waltz). The Kit Kat Boys: all voice types and ranges, must be able to dance, these individuals will also be part of various scenes as performers, club patrons, and much more, all should be comfortable with being flexible in gender depictions and must be prepared to do a large amount of in-depth character work in the rehearsal process, developing back story and specific traits; casting personnel state: "Do not make the mistake of thinking of these roles as 'just chorus.' Kit Kat Klub boys will also play the following roles: Bobby, Victor, Max, Customs Officer, Maitre D’, Assistant Customs Officer, Taxi Man, Nazi Guards, and German Sailors who frequent Fraulein Kost’s services."